569 & 565 Bloomingdale Road. Image: Courtesy of LPC. Four buildings date to 19th century community founded by African- American freedmen. 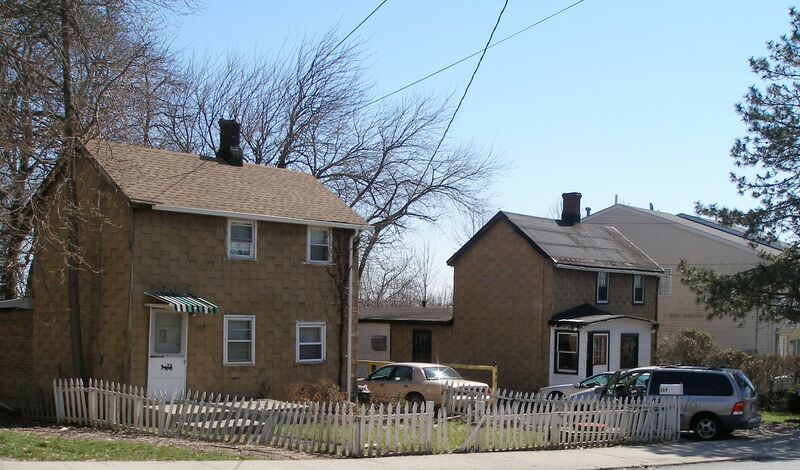 On February 1, 2011, Landmarks celebrated the beginning of Black History Month by designating as landmarks four buildings in the Sandy Ground community of Rossville, Staten Island. Sandy Ground was established in the 19th century as one of the country’s earliest African-American freedmen communities. The community grew when African-American oystermen migrated from the Chesapeake Bay after Maryland passed laws restricting African-Americans from captaining their own boats. Landmarks designated the cottages at 565 and 569 Bloomingdale Road as a single landmark, and in separate hearings, designated the Rossville A.M.E. Zion Church at 584 Bloomingdale Road and the Coleman House at 1482 Woodrow Road. Landmarks initially held hearings on the buildings in August 2010. 7 CityLand 126 (Sept. 15, 2010). The Bloomingdale Road Houses were built in the 1880s by an unknown architect and represent the small-frame houses, known as “baymen’s cottages,” that were once common to the area. A third cottage, built concurrently, has since been demolished. The two-story buildings feature three-bayed facades, gabled roofs, and central chimneys. The houses’ siding and roofing materials have been replaced, but the structures are otherwise intact. The one-story Rossville A.M.E. Zion Church was built by Andrew Abrams in 1897 as the congregation’s second place of worship. Over the years, the church has lost its steeple and the original clapboard siding has been replaced with fauxbrick siding. The structure’s essential form and fenestration pattern remain unchanged. Landmarks designated the church’s cemetery as an individual landmark in 1985. The Reverend Isaac Coleman and Rebecca Gray Coleman House was built by an unknown architect sometime prior to 1859. The Colemans purchased the wood-framed and clapboard house in 1864 after moving to Sandy Ground following Isaac’s appointment as pastor of the Rossville A.M.E. Zion Church. The house has remained within the Coleman family since. The original structure was likely a two-room home which was expanded to accommodate the growing family. The Commissioner’s unanimously designated the buildings. Landmarks’ Staten Island representative, Vice Chair Pablo Vengoechea, noted the importance of protecting the buildings in light of the area’s rapid development, which he stated was “nearly destroying every vestige of the area’s history.” Commissioner Michael Goldblum said that despite their “humble” appearances, the buildings were “exemplars of historic and cultural landmarks.” Commissioners Margery Perlmutter and Fred Bland said signs should be created to inform the public about the importance of the buildings as remnants of the historic community. LPC: 565 and 569 Bloomingdale Road Cottages, 565 Bloomingdale Rd., Staten Island (LP-2415); Rossville A.M.E. Zion Church, 584 Bloomingdale Rd., Staten Island (LP-2416); Reverend Isaac Coleman and Rebecca Gray Coleman House, 1482 Woodrow Rd., Staten Island (LP-2414) (Feb. 1, 2011).